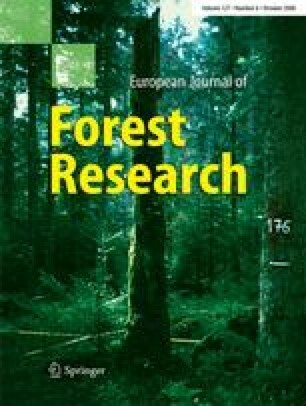 This study aimed to improve knowledge about the nutritional status, site requirements and site classification for European ash (Fraxinus excelsior L.) and sycamore maple (Acer pseudoplatanus L.) by reinvestigating young plantations from 1991/1992 on windfall-affected areas in Bavaria/Germany after another decade. Compared to the first survey in 1995, most stands improved their nutritional status until 2006. With the data set of element concentrations in leaves of ash and sycamore available, the range of adequate nutrition could be determined for these species in the pole stage phase. Both species show considerable height growth on a wide range of sites. Mean annual height growth of dominant sycamore trees increased with rising foliar N or P concentrations but not for Ca, Mg, K, Mn, Fe and Al. For ash, there was no relationship between the foliar nutrient level of any element and mean annual height growth. However, total height around age 20 was favourably influenced by high base saturation and a good water supply at well-drained sites. On acid soils, where nutrients are delivered by subsurface water flow, well-growing stands are found as well. Soil water status according to the state forest soil classification had no significant impact on mean annual height growth. Ash and sycamore show reduced productivity on some (moderately) dry soils and fail on poorly drained moist sites. Based on these results, the classification of forest sites suitable for ash and sycamore within the Bavarian study sites was revised. Dedicated to Professor Dr. Karl-Eugen Rehfuess on his 75th birthday. The authors thank the Bavarian State Ministry of Agriculture and Forestry for financial support of the project (grant number ST180) and the Department of Forest Nutrition and Water Resources, Technische Universität München, for performing the foliar analyses. The authors and former students of Professor Dr. Karl-Eugen Rehfuess are deeply grateful for his useful recommendations on the draft paper and cordially compliment him on his 75th birthday in 2008.